Gorgeous weather today will give way to warmer and more humid weather tomorrow into Saturday. Showers and storms associated with a cold front will move through Saturday. Just how strong those storms will end up being remains in question. Cooler and drier air filters in Sunday while the mountains could see a spot shower or two. Heat, humidity, and the threat for storms slowly builds into the latter part of next week. For more details on each of those, read on. Current Conditions This Evening Verifying The Forecast For Today. Today was, as expected, another beauty across ME and NH. Temps are currently sitting in the low to mid 80’s for most with some 70’s along the coast. 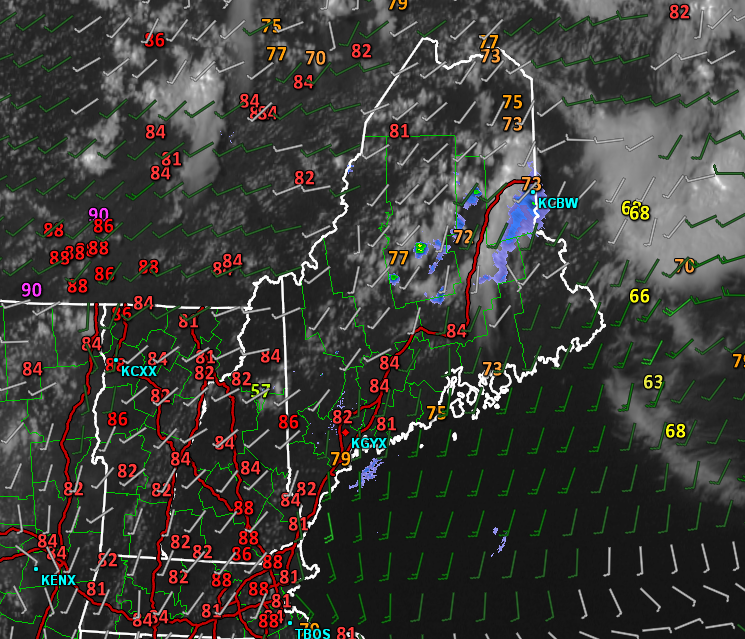 A solid sea breeze developed bringing gusty S winds to the immediate coast. The rest of the evening will feature gradually cooling temps and mainly clear skies. 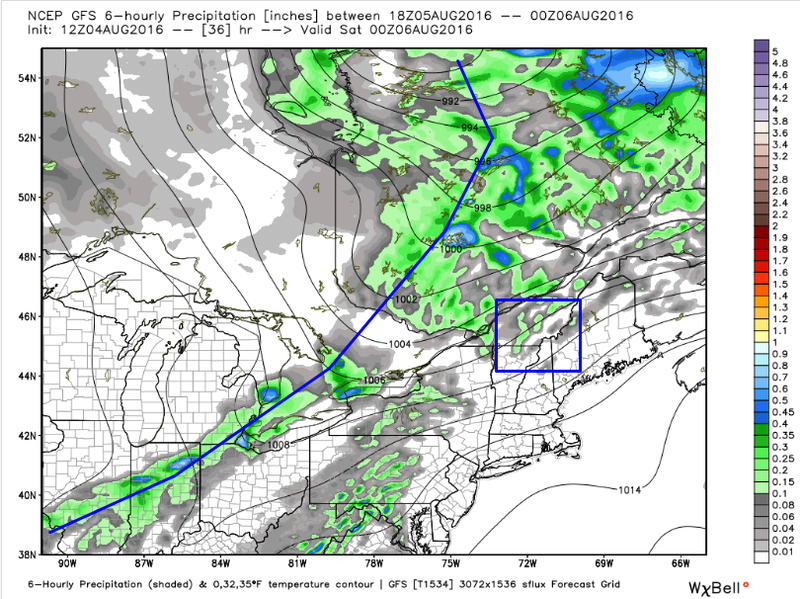 The north country will continue to run the risk of a shower or two but no widespread precip is likely. A slightly warmer and stickier night is in store for tonight but generally comfortable sleeping weather is still forecast. Tomorrow looks to continue the theme of lovely Maine weather though heat and humidity looks to slowly increase through the day. Highs will again be a tad warmer with mid to upper 80’s expected for most, with low to mid 80’s in the cooler spots (north and coast). Slowly increasing clouds are expected along with the chance for late day storms for northern and western areas. Humidity will also be on the rise with dew points climbing into the low to mid 60’s by afternoon. 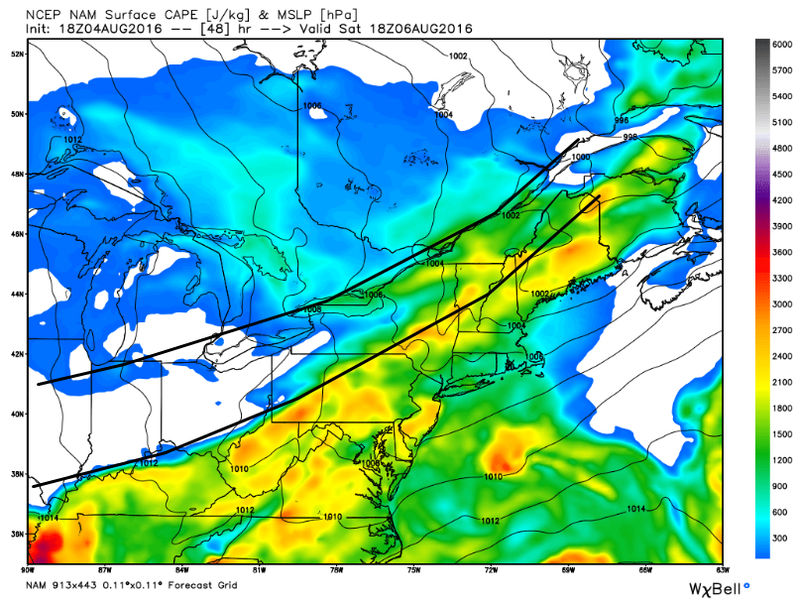 Saturday will be our most interesting day as strong upper level energy drives a cold front through the area. 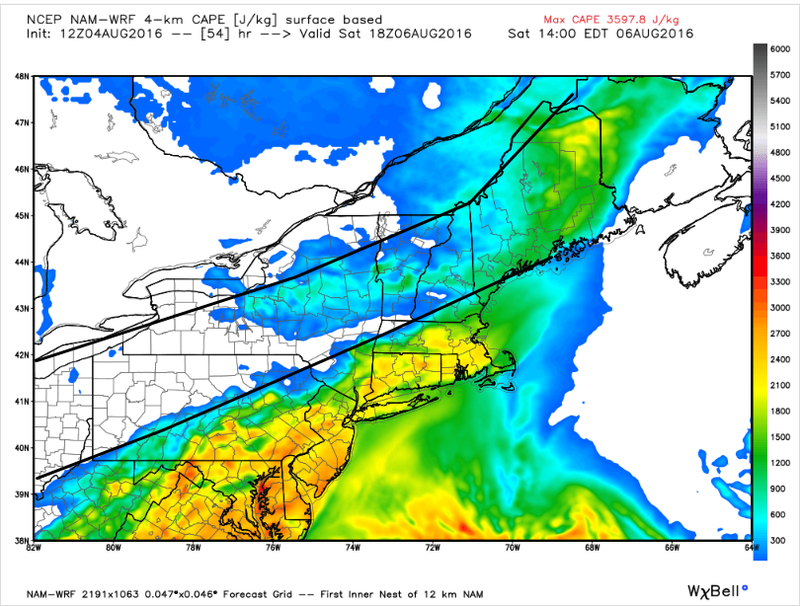 The timing of the front, however, remains significantly uncertain. Uncertainty in the timing of the front means uncertainty in the instability forecast which means great uncertainty in severe weather potential. Remember our three ingredients for severe storms? We will have two for sure, possibly all three. The first (trigger) is shown above. A strong disturbance will be moving through aloft and a seasonably strong cold front will accompany it. No doubt storms will fire should enough instability develop. There will also be plenty of ingredient number two around: shear. Shear organizes storms so that they can produce severe weather. 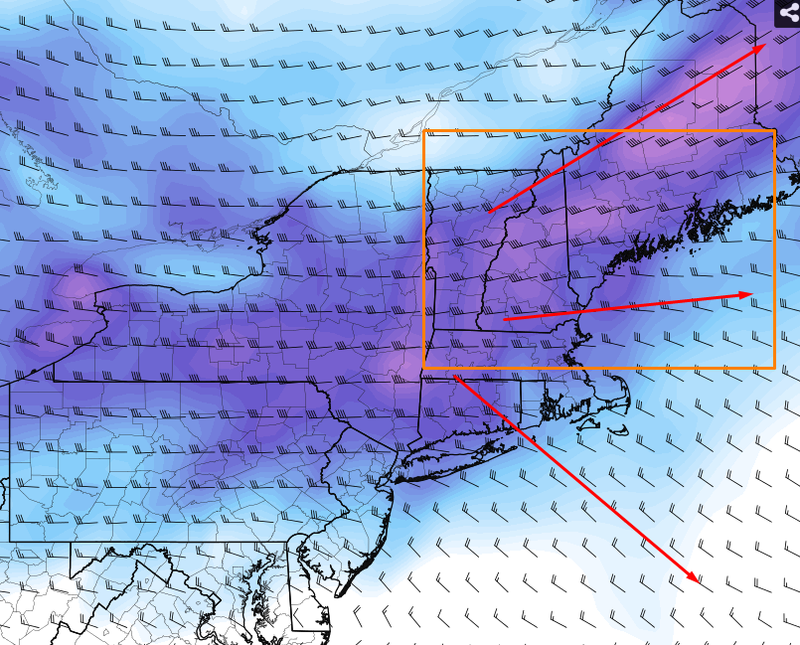 0-6km shear is forecast to be in excess of 40kts across the entire area Saturday which will no doubt be enough to organize storms if they form and have enough energy. The trigger we’ve already established is well defined, it’s the energy part that remains a toss up at this point. The significant uncertainty in the forecast stems from uncertainty about when exactly the front will cross the area. The slower the front is, the more time there is for instability to build, the more energy there will be for storms and the greater the chance for severe weather. The opposite would be true for a faster front. Guidance has picked up on a slightly more amplified pattern for the coming days which would suggest a slightly slower front. However, there is plenty of upper level energy behind the front to hurry it along. 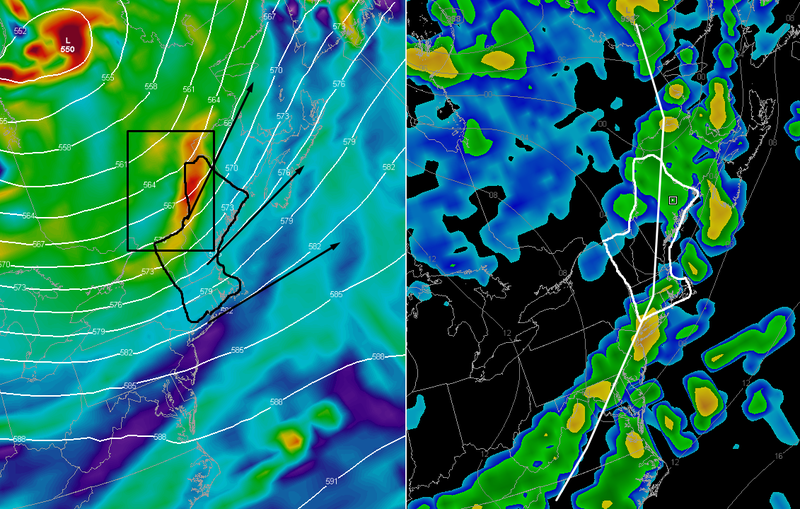 Above, the 12km NAM shows one possible solution: the front is slower and there is more energy. IF that were to happen, we could see fairly widespread severe weather. Be prepared for this solution to happen even though I don’t think it’s the most likely. The 4km NAM, the GFS, and the Euro are all taking the faster solution with less instability for Maine and New Hampshire. In this solution, the front would already have cleared the mountains by mid day and would be moving over coastal areas in the early afternoon producing weaker showers and storms. Right now I would be prepared for severe weather but would expect something more along the tamer lines. Even with the lower instability solution, there still is the chance for an isolated severe cell especially in eastern areas. Also remember that it doesn’t take severe weather for a thunderstorm to be dangerous. Lightning is just as deadly as strong winds or hail! When thunder roars, go indoors. Here is the SPC forecast for Saturday which includes the entire area in the marginal risk zone meaning that isolated severe storms are possible. I will have more updates on this tomorrow as we hopefully are able to resolve some of the questions about the forecast. What comes after Saturday (right Pink box with high temps, humidity, and precipitation)? A period of cooler, drier weather is likely through early next week (middle pink box) before heat and humidity build again towards the middle of next week. Our next chance for storms comes with a weak disturbance Wednesday (clouds and precip in the left pink box). More on that as we get closer.